REVOLUTION is a thrilling novel of intrigue, deception, betrayal, courage and the remarkable resilience of the human spirit under unbelievable circumstances. It illustrates how Fidel and his brother Raul lied to the Cuban people, cheated those who helped them fight against Batista and murdered their way into power, removing anyone and everyone they saw as a threat. Revolution is the story of the Quintanas, an ordinary middle class family thrown into the turbulence of a civil war during the Cuban Revolution, as they witness their normal everyday lives change dramatically for the worse and watch as family members turn against each other. Joaquin Quintana is one of the original 82 men who landed in Cuba with Fidel to fight against Batista and liberate their country from that dictatorship. 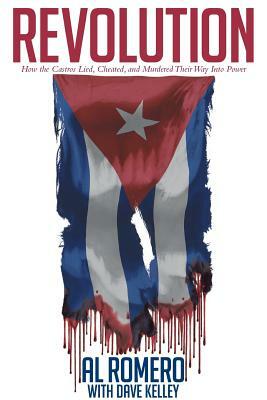 He rises to a high level position among the rebels and becomes part of Castro's inner circle. After consolidating power, Fidel aligns Cuba with the Soviet Union and many of the men and women who fought with him against Batista are rounded up, jailed or executed. Joaquin, disillusioned with how the new regime has bastardized the ideals that he and so many of the rebels fought for and believes Fidel and his brother Raul orchestrated the murder of his friend and great revolutionary leader Camilo Cienfuegos, makes the decision to work with the CIA to over throw the Castro regime. Joaquin's bothers Diego and Cesar, join him in plotting against Fidel while Elena, Diego's daughter, becomes a blind and fervent disciple of Castro.